Codecamp Romania - Page 7 of 12 - The official Codecamp Romania blog. Is your team getting the most out of code reviews? Most serious developer teams today have at least some form of code review discipline in place. This means that at least one person, other than the author, looks through a new code change before the change goes out to production. There is a good reason for that; code reviews, even when practiced less formally, have been found to increase the quality of a software product by reducing the number of defects. See  for research involving modern open-source software projects. As principal engineer at Ness Digital Engineering, I see teams that do code review with varying degrees of rigor, from a light touch approach, all the way to mandatory, thorough reviews by at least two other engineers. Irrespective of the actual process, the benefits of a code review discipline in your team go beyond whether the number of coding defects is below your threshold for quality. We will take a look at those first. What I’ve repeatedly noticed is that very few engineers actually look forward to having their code reviewed. It feels like a trip to the dentist: you know it’s good for you, you know that a small intervention now prevents major decay later, but still your mom or your partner has to push you to go, because the anticipation of the drill in your mouth doesn’t exactly thrill you. In the second part of this post we’ll review some tips for running effective code reviews. Here are other benefits of code reviews you should keep in mind for your team. 1) Code reviews spread knowledge and create a sense of ownership of the entire code base. If Alice has become an expert in module A of your code base, and Bob is an expert in module B, Alice can learn new things by reviewing Bob’s code changes in module B, and can in turn, guide Bob when he makes changes in module A. Your team is healthier when it’s free of “cliques,” and everyone feels that it’s OK to make changes to any part of the code. Also, most assume that it’s always the more senior engineer who reviews the junior engineer’s code, but a junior engineer should also be asked to do a review; he or she will learn a lot by reading through and trying to understand a code change from a more experienced colleague. Oh, and, inevitably, the time will come when a junior finds an issue with a senior’s code. To find out what to do to prevent bruised egos, skip towards the end of this post. 2) Code reviews add skin in the game. If I review and approve a code change by Charlie, my name is on the record. If that change introduces a defect, it will not be just Charlie who takes the heat. 3) Code reviews prevent deviation. It’s important for a team’s code base to have a consistent “style of doing things” everywhere. A consistent style reduces the cognitive burden of an engineer who must make changes to an unfamiliar section of the code. It doesn’t have to be the best way of doing things, even when the best way is objectively so. (it’s usually not, and likely to cause endless debate within the team). Here is an exaggerated example of why consistency is important. You can debate whether it’s better for motor vehicles to drive on the left or on the right side of the road, but an “interim” state, when trucks drive on the right and small cars drive on the left, would be a disaster. Here are some tips on how to run code reviews effectively and with minimum pain. Make them quick and non-formal. There should be no extensive meetings, and the process should be as light as possible. This lessens the friction for the reviewer. The easier it is for a reviewer to jump in, the more time he or she will have for looking over the code changes, and that’s a good thing. .
Make them frequent. Discourage huge changes and instead, insist that changes be submitted, reviewed and merged after two days of work, maximum. Make them painless for the reviewee too. Encourage the reviewers to critique the code verbally in a one-on-one with the author. Discussions will be faster and less confrontational when done face to face. Beware of the cultural sensitivities in your team. Some authors may feel uncomfortable or ashamed if there are permanent records of the shortcomings of their code, such as normally done in a GitHub pull request. In that case, it’s better that all reviews happen verbally, and the only permanent record is the sign-off (thumbs-up) from the reviewer. Give adequate time for the reviewer to actually read and understand the code change. Common sense, as well as research,  indicates that the effectiveness of reviews is reduced by the more lines of code per hour a reviewer is asked to review. Make the reviews fair. Ensure reviews are not dictated by the personal taste of the reviewer. Instead, insist that the team have a Coding Conventions document. Review with an optimistic mindset. If the reviewer can’t find anything wrong with the code, it’s probably because the code is fine and should be given a thumbs-up right away. Don’t guilt-trip reviewers into hunting for issues where there aren’t any. The review activity is sure to descend into nitpicking. Anyone who has been on the receiving end of it remembers the frustration. This is a toxic culture that should not be allowed to spread in your team. Keep the reviewers focused on major functional issues, or issues affecting readability and changeability, such as proper naming and adherence to SOLID principles. Don’t focus on line length or any sort of issue that a static analyzer can catch. In fact, you should have a static analyzer (such as ESLint or Sonar) run before starting a code review. Finally, just like with any process, don’t let the code review process go stale. Take the opportunity to improve things after every sprint retrospective. Measure the number of reviews per change, the total time a task spent in code review, and the number and magnitude of new commits added to the changes during review. This gives you an indication of the impact of the reviewers on the code being reviewed. If your team is just getting started with code reviews, you will probably need to choose a tool. Pick one that the team already knows or already has installed. Your code hosting platform, e.g. GitHub, BitBucket, Gitlab, already offers code review features. There are also open-source tools specifically for code review, e.g. Gerrit, Phabricator Differential, ReviewBoard, as well as many commercial offerings. Situational Leadership®: Taking Charge is 1 day workshop designed to help front-line employees and individual contributors develop a thorough understanding of the leadership process. When employees can recognize a clear connection between their performance and the success of the organization, they perform to the full extent of their capabilities, as opposed to simply working within the parameters of their job descriptions. Utilizing the performance language of Situational Leadership®, participants learn to diagnose their own task-specific Performance Readiness® and effectively communicate their specific performance needs to their supervisors. TRAINING KIT: Participant Workbook, Taking Charge Handout, Taking Charge Action Planner, Triangle Production Worksheet, and Participant Certificate. Training based on Situational Leadership® Model, the most powerful system utilized globally for increasing leaders’ performance in work environment and their results, obtained through the persons they are coordinating, regardless of their hierarchical position in organization or their functional role. Situational Leadership® – Leveraging Your Power to Influence® explores the dynamics that exist in the seven distinct, but highly interdependent, bases of power. This one-day workshop focuses on developing your leaders’ ability to recognize and successfully apply the correct power base in order to effectively influence across all levels of the organization – up, down and across peer groups. Participants will learn to cultivate their personal and position power bases to help enhance leadership effectiveness and increase overall team performance. The program directly supports the use of Situational Leadership® skills of assessing readiness and applying the appropriate leadership style. Additional emphasis is placed on the challenges faced by team leaders in coaching others to build power bases with their team members. To describe personal and position power and the differences between them. To build and leverage their own power bases in order to influence up, down and across the organization. To discover which power bases they may tend to overuse and underuse, and whether they have enough of the right power to influence others. To help their team members to build and apply power bases on their own. It’s a lovely Sunday morning. You grab your phone, wallet and keys and rush out for a cup of coffee. Going through all your Visa cards, discount cards, coupons and lots of bills, you realize you have no cash and the guy at the counter tells you the credit card POS is broken. With the next ATM located about 30 minutes’ walk from the shop, no coffee for today. What if I tell you this hurdle might soon be over? That you’ll need nothing more than your phone to pay for your coffee on Sunday mornings, order your favorite products, get discounts at checkout or buy tickets to the most amazing shows. And you will no longer have to carry that big wallet with you. An innovative app will keep all your credit, debit, discount cards and, on top of that, will allow you to pay for your purchases with just one quick scan and a simple OK’. Done. And what’s more exciting is that you now have the great opportunity to be part of the team that is developing the app and preparing OK for its national launch. But first, let’s see what it does and how it is built. The Story behind the app is simple. We all know that the payments space is fragmented and the mobile payments one, in particular, is sometimes a confusing mess. There are thousands of competitive solutions for payments, dozens for digital wallet apps, just as many for accepting payments and even more banks, Fintech start-ups and merchants all going for the same slice of the pie. And, somewhere in the middle, is the consumer who struggles to keep up with all of these and tries to identify the one solution that will solve all his problems. But nothing seems to work. No one has achieved critical mass. Why OK? Because it’s the most simple and universally recognized word that tells the same thing to any person, anywhere in the world. Using OK, you OK basic actions like a sign up, log in or money transfer all the time. Two letters, one outcome. Beautifully simple. OK addresses the needs of both consumers on one side and merchants, brands/OEMs, banks, media, charities, events on the other side, basically anyone in the retail ecosystem. OK seamlessly integrates authentication, marketing and payment into a consistent and compelling experience across the board. The phone becomes the universal user ID, card and payment terminal – all rolled into one. And the 5-digit OK-code is the single password that the user only enters. Only on his own phone. The innovative mobile app offers much more than payments. Basically anything you find in your wallet is integrated in OK. Coupons, tickets, receipts, gift cards, punch cards, payment cards, IDs. Everything. Retail will never be the same again. Finally you can reap all the benefits you’re offered, but without the hassle. And pilots have clearly shown that consumers love it. How it works – the OK app uses barcodes and QR codes which allow the users to scan a code with their camera, or let it be scanned from the screen. What does it mean exactly? That you can scan codes in any channel, including in print, outdoor and on screen and use them to add coupons, punch cards or even buy products or tickets to a concert. If you shop at a merchant, your phone screen will be scanned and you’ll receive an OK request with all the purchase details. All you have to do is say OK and confirm with your own 5-digit OK-code. You have the possibility to set when your OK-code is required and you can disable it for low amounts. Also, as opposed to the current checkout, where you have to enter all your data before even initiating a transaction, OK allows you to give all the data requested by the merchant to fulfill the transaction, but only after you OK it and with a clear transaction-based usage consent. In terms of availability you have nothing to worry about. There are two free applications available, one for iOS and one for Android. So, regardless of your technological or brand preferences, your experience with OK will be scalable and seamless. The platform is built around a REST API which does the heavy lifting so that the client apps, the mobile apps for iOS and Android, can focus on providing a pixel-perfect user experience. We are OK. And so should you – We’re not going to lie to you. This is big and, after the official launch this year, is going to become even bigger. During the last couple of years, a young and highly talented team has been working really hard to make OK what it is today. And the best part is yet to come. The big retail brands are signing up. Once merchants and consumers start using the app, we’ll move onto the next phase of making OK even more complete, smarter and sophisticated while keeping it, most importantly, super simple. These bright people are currently looking for a creative, dynamic and committed person to join their team and make OK greater. If you’re comfortable being actively involved in a growing project, sharing and debating your ideas and constantly interested in learning and improving your skills, then this is definitely the best place for you. Take this challenge and you are going to enjoy it, no doubt about that. As it transitions from a disruptive tech trend to a mainstream industry, Fintech is gaining significant ground among digital users. A recent survey shows that 15.5% of digitally active consumers have used at least two Fintech products within the last six months. As awareness of the available products and services increases, adoption rates are expected to double within the year. Harnessing technology to deliver value and convenience, forward-thinking financial institutions are putting customers first and developing products and services to retain them. How do you see the Fintech sector today? Fintech remains a prolific industry, regardless of the tough regulations. It has generated more than 17 different subcategories and has seen 1000s of companies being created in the last years. Just a quick look at these subcategories and you’ll find anything from highly niched areas as financial research tools or equity investment platforms, to broader areas such as payments or business management tools. What is interesting is the specialization and vertical drive that each category takes. While there are a number of companies building more generic products and services, there is a path towards dissecting the financial industry into small segments, decentralizing it, rebuilding it and innovating each area at a time. What do you think are the next trends in financial software? When trying to understand where a market will be in 10 years, there are simple things that make sense and others that involve higher risks. As we are actively involved in financial software development, we look at the main development tendencies that can have the potential to be disruptive, or that have passed the stage of early adopter buzz. These last ones, in particular, can develop into mature markets. In terms of actual trends, predictive technology and big data are probably the first ones to come to mind. Blockchain and alternate currencies also have a potential to disrupt, however the risks associated with them are still high. Last but not least, mobile and wearables are already influencing money transfers, customer service and digital security, and are paving the way for digital identities to become an even bigger trend. How do you see the impact of predictive analysis then? Predictive analytics, user tracking and machine learning will allow financial institutions to develop automated processes for on-the-spot credit decisions, for example. This benefits both customers and the bank when, for example, a customer who is overextended on their credit card is given an automatic credit line extension and authorization (a machine-based decision), instead of facing an embarrassing decline when they cannot pay the restaurant bill. It is definitely a game changer, as it allows financial organization to make use of data and payments behaviour to reduce decision times and bureaucracy, in this case. Besides payments, you can develop financial concierges which could also use analytics to offer targeted loans and products, based on the customer’s past behaviour. That could mean financing the customer’s next vacation or car loan, when customer tracking shows that consumers are actively looking for these services or goods. The key is to use these technologies in a non-invasive manner, and focus on assisting and helping the customer, by remaining service-oriented and respecting their privacy. For the SEPA members, Access-to-Account (XS2A) as part of PSD2 increases the possibilities to use accountholder’s information for analysis purposes. XS2A offers third party service providers (TPPs) to have access to (consumer and business) payment accounts when the accountholder provides explicit consent to do so. PSD2 makes a distinction between two types of TPPs: payment initiation services providers (PISP) and account information service providers (AISP). Imagine what this might mean for large online retailers like Schwarz, Carrefour, Tesco, etc. They can facilitate their customers with all kinds of tailored financial services. This will boost the customer loyalty! It would be interesting to see who will be the first to offer a dashboard with my different payment accounts, a new third party provider or a bank? Once it becomes more clear what different European banks demand regarding security and interfacing with their accountholder’s information, we at Maxcode are ready to develop these dashboards. You mentioned digital identities as a trend, why is that relevant? Digital identity solves the problem of fragmented identities. Bringing some cohesion to this issue will provide the banking sector with new opportunities, as well as new social responsibilities. This will impact how we relate to one another, how we do business transactions and even redefine the notion of trust. What do you see as the main benefits of digital identities? Mobile and epayments are common at this point. With the rise of these solutions, the requirement of secure and verifiable digital identities will become mandatory. You see, we need to be able to verify online identities not only in banking and payments, but also when accessing sensitive information securely, such as medical records. The applications are extensive and a broad recognition is needed. As support and use of online and mobile financial services is rising, the demand for digital identification services will increase, making financial markets and consumers more likely to adopt the new payments model, rendering most transactions cashless. 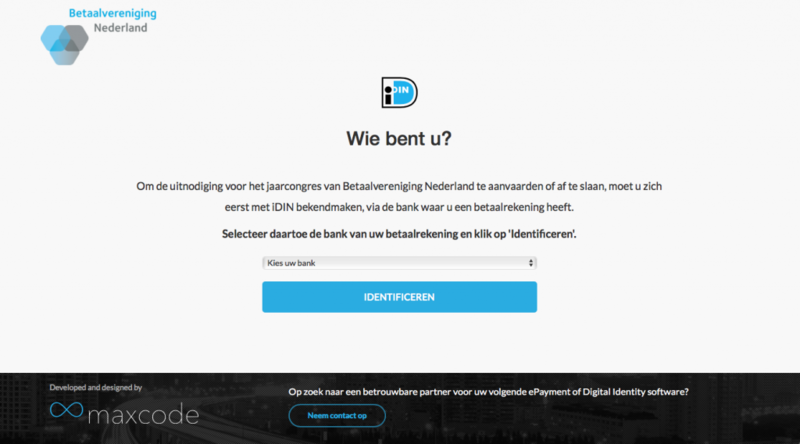 I do believe it is a great advantage that BVN launched iDIN in the Netherlands. Maxcode already implemented iDIN within SURFnet, allowing their users to access information from universities or big corporates using their online internet banking as authentication. Wearable payments made headlines for a while but the buzz has died down; Why do you think that is? Every new industry has a buzz period followed by a maturity period when suddenly the technology itself is no longer that attractive but becomes mainstream, making it “affordable & needed”. From a strictly technological point of view, there are still important issues around the devices involved and around software interaction. Does a device rely on Bluetooth or NFC? Would a certain service only work with specific OS like Android? Etc. The fact of the matter is that the costs involved are still high, if we consider the huge investment Disney made to embed wearables into their ecosystem with Magic Band. Wearable technology payments should integrate with as many platforms as possible. As the market develops, the cost of these solutions will drop, allowing more sustainable development efforts to be made. Powering a wearable device with payment data is part of research and development from start-ups to banks. Replacing the chip and pin cards with fingerprint authentication on smartphones might not be very trustworthy just yet, but wearables have the advantage of diversity when it comes to implementation. Regardless of the form, wearables have a main advantage: they are always on, always available, frictionless devices. On the other side, the main challenge in the payments field is security and wearables are not yet seen as being secure. Consumers still feel more comfortable and safe using online payments or cards. The success rate will be highly dependent on a delicate balance between security (and the public’s perception of it) and the convenience it provides. What else should be on the radar for industry startups and established companies alike? If I were to choose, probably the API Economy would be it. This digital, automated exchange of business competencies allows organizations to integrate core services with one another, in order to develop and expand business cases and new markets. “Connect to stay ahead.” as you have to continuously evolve to enjoy and take advantage of the business opportunities from today’s markets. It is a growing economic force in today’s business environment but maybe not as visible sometimes. The concept has outgrown the software development meetings and reached the agenda of business strategy sessions and executive planning. API’s have been promoted from technology to business model lately which makes a lot of sense, but they are still missing from a lot of board room agendas. They certainly are worth considering. No true developer will ever say that attending a hackathon seems completely foreign to them. During the last couple of years, such gatherings have registered a significant growth in number and uptake across the globe, including our country. Hackathons are usually organized over longer periods of time, ranging from 24-48 hours to even a couple of days. During this interval, participants normally join hands and knowledge to build software and learn new things while doing it. Yet, such events can sometimes be quite tiresome and in your hurry to build as much as possible, you might be missing on other important things, such as having fun and enjoying yourself or getting to know other people. After organizing two internal hackathons and also participating in a few longer ones, Maxcode gathered three good reasons for which companies should organize internal hackathons more often. Having a day to work side-by-side with colleagues from different teams and even newcomers or interns is a perfect chance to discuss and connect deeper with other talented and motivated developers who like building things just as much as you do. This will be a great opportunity for all to learn new things about the technologies used and, why not, even learn a new programming language. However, a hackathon doesn’t mean it has to be all work and no play. And this was exactly Maxcode’s motto for the day. The coding sessions were perfectly mixed with short coffee breaks, photo shoots and brief chats with peers. Doing all this in the familiar context of the office made everything easier and more relaxed. Internal hackathons are the perfect moment to allow people to work on their personal ideas. Since no one is imposing a certain topic or area, everyone can come up with a great project to be implemented. For Maxcode’s latest Hackathon, they’ve set a small condition, yet people had plenty of chances to let their imagination run wild: all projects should be using cloud technologies. Other than that, everyone was free to propose an idea they wanted to turn into reality. Therefore, during an entire day, 8 teams have worked hard to implement their most interesting and challenging ideas. And they’ve had it all, from bots that can fill in the timesheet on your behalf or monitor flights and let you know when prices for a certain destination/period are lower to software that uses Cognitive Service to identify faces from pictures and analyze people’s emotions. In every IT company there are also a lot of people that are not in the programming business and an internal hackathon gives everyone the possibility to bring their contribution and to feel they are part of something bigger. For Maxcode, there were the system administrators that permanently ensured that the teams have the perfect conditions to develop their projects, the human resources and social media coordinators that kept everyone’s spirits up and shared real-time updates with our readers. A lot of other people have been involved in organizing and handling the administrative aspects of the event. It was an amazing common effort, they had a lot of fun and they’ve realized that they can successfully collaborate even if they are in different teams and have other duties than the ones they usually handle at work. AI as a strategic area of investment in order to stand out from the crowd. For instance, a survey conducted by Vanson Bourne, a research firm on behalf of Teradata on 260 IT and business decision-makers, reveals that more than 80% of companies are investing in AI. Even if AI has an impact on all industries, there are several areas that will be revolutionized by it. The above-mentioned survey also shows that 59% of companies from IT and telecommunication expect to take advantages from AI, followed by 43% business and professional services and 32% of customer services and financial services. 2018 it’s considered the year when AI will expand more to medical diagnostics. “By the end of next year, I think around half of leading healthcare systems will have adopted some form of AI within their diagnostic groups. In 2018, we’ll begin the adoption of a technology that may truly transform the way providers work, and the way patients experience healthcare, on a global scale”, explains Mark Michalski, executive director, “Massachusetts General Hospital” and “Brigham and Women’s Hospital Center” for Clinical Data Science. AI has changed so much our daily life that soon we will ask ourselves how we were able to live without it. 2018 is expected to be the year in which voice-based gadgets will work together and have personalized media – from reports to music playlists, according to our taste and interests. AI also seems to bring changes in the labor market. People are concerned that their jobs will be replaced with robots in the future. According to a Gartner report from December 2017, AI will replace only low-level, routine work. Besides this, AI is expected to generate more new jobs – 2.3 million by 2020, while eliminating only 1.8 million jobs. Read this article and learn more about this topic. Codecamp Iasi will be back on March 24. Don’t forget to register HERE. The complete agenda will be announced soon. For most of the Romanian, BRD is a day to day presence, spread all over the country. We are a Top Romanian Bank and one of the companies listed at BVB. We have also a long history. Descendent of the National Industrial Credit Society, created in 1923, BRD was initially the Investment Bank of the Romanian country before becoming, in 1990, an universal bank. In 1999, Societe Generale became the majority shareholder of the bank. The French bank, one of the biggest from the euro are, with 145.000 employees in 66 countries and over 31 mil. Clients from all over the word, transferred in Romania know-how that allowed us to become shortly one of the leaders of the Romanian market. We constantly are looking to innovate ourselves, while offering to a wide public programs and products tailored, from kids to students and businesses of different sizes, comfort and security. We have 2.3 mil clients and 780 branches. Our activity covers three major business lines: retail and IMM, big corporations and investment banking. With over 7.500 employees we are one of the biggest banking employers. NTT DATA Romania provides development assistance and expert advice for customers across various industries, IT service providers, system integrators and software companies. The services offered cover the entire software development and management lifecycle. Currently the company serves over 300 clients in multiple countries, including Romania, Germany, Austria, Switzerland, Netherlands, Norway, Finland and USA. The added value provided by NTT DATA Romania lies within the specific know-how of various business lines. This includes a thorough understanding of the main challenges felt by clients and the current economic environment. These aspects have significantly contributed to the growth of the company over the past 17 years, along with consistently enhancing customer experience. Continental is a top-tier automotive manufacturing company that specializes in tyres, interior electronics, chassis components, brake systems, powertrain, tachographs and numerous other factors related to the transportation and automotive industries. Continental is divided into five sections: Chassis & Safety, Interior, Powertrain, Tyres, and Contitech. One of the company’s main areas of expertise is fuel consumption, attained via reduced-resistance tyres, more efficient fuel injection systems and hybrid propulsion systems. As a Fintech constructor Maxcode excels in the development of online payments and electronic identification. Components developed by Maxcode are based on newest technology, built by engineers who are experienced developers, and also bring years of knowledge on the concepts behind many used payment methods and identification protocols. Since 2007, the Levi9 delivery center located in Iasi has brought together a growing team of young and talented professionals in an inspiring environment, based on the highest standards of excellence. More than 130 Levi9 professionals are ready to share their expertise in areas such as .NET and Java Software Development, Software Testing, Business Intelligence and IT Operations, all with an agile spirit. Preh is a global automotive supplier founded in Germany in 1919. Ever since Preh has stood for technical innovation, excellent quality and great flexibility. Today, the world’s automotive premium brands count among our customers. For example – to name only a few – we develop and manufacture iDrive Touch controllers for all BMW models, steering wheel switches for many Mercedes-Benz models, such as the S-class and climate controls for Porsche, such as the 911 or Cayenne. Worldwide around 7000 employees are working together to achieve an annual organic growth with two digits. The strongest growing development sites in Romania, especially in Iasi, will face various challenges which appear due to the constant innovation of the automotive industry such us Touch applications, approach sensing, active haptic feedback, high voltage/power electronics, safety standards up to ASIL C as well as cloud applications for a continuously connected car. Were you aware that Harman designs, manufactures and markets a wide range of audio, lighting and infotainment solutions for the automotive, consumer and professional markets? For example, did you know they engineer the infotainments systems for BMW (iDrive), Mercedes-Benz (COMMAND), Audi (MMI), Chrysler (Uconnect) and many more? Harman is a recognized world leader across its customer segments with premium brands including AKG, Harman Kardon, Infinity, JBL, Lexicon and Mark Levinson. The company is admired by audiophiles across multiple generations and supports leading professional entertainers and the venues where they perform. More than 25 million automobiles on the road today are equipped with Harman audio and infotainment systems. More than 80 percent of the world’s luxury cars are equipped with our premium audio and infotainment systems. Your favorite music, movie or television show was likely recorded or broadcast with our help. We share the stage with talented performing artists from every genre, and we fill the world’s premier sporting and entertainment venues with great sound and light. But HARMAN stands for more than just great sound. We help create great lifestyle experiences for today’s connected generation. Updates and enhancements are automatically downloaded as they become available, and real-time diagnostics alert you when routing services or repairs are indicated. For more about our automotive cloud offerings, visit the Connected Services section of our website. HARMAN’s innovative and highly integrated infotainment technologies offer automakers the most complete solutions for advanced navigation, intuitive user interfaces, integrated audio, device connectivity, cyber security, and connected safety, just to name a few. From Boston to Berlin to Bangalore, HARMAN is delivering a dynamic in-car experience for an increasingly connected world. UniCredit Business Integrated Solutions is the Group’s global services company created from the integration and consolidation of 16 Group companies and is dedicated to providing services in the sectors of Information and Communication Technology (ICT), Back Office and Middle Office, Real Estate, Security and Procurement. It is one of the first service companies to be created at European level and its aim is to consolidate and reorganise those operational activities necessary for the correct functioning of the Groups’ business by leveraging on a more flexible delivery and an improved response time. The company includes about 10.600 people and oversees activities in 11 countries: Austria, Germany, Italy, Poland, Great Britain, Czech Republic, Romania, Slovakia, Hungary, New York and Singapore. Appsbroker is Google’s largest partner in Europe, helping drive Google Cloud and Apps adoption at major enterprises across the globe and helping hundreds of thousands of people embrace SmarterWorking. Their SmarterWorking solutions leverage the power of Google Cloud to help modernize and streamline big business functions; helping teams collaborate and transform ways of working. Appsbroker delivers digital transformation strategies that unlock real business value. Whether it’s hidden in data, corporate knowledge, people, or processes; Appsbroker’s SmarterWorking solutions, built on Google Cloud, are leading the way in business transformation. Since 2004 Beenear have been offering services for IT&C field, for the European market, especially for the Italian one. Through a commercial agreement, since 2013 the company entered on the German market. The company is based in Iasi – Romania and was born from an Italian business initiative (involving private individuals and public institutions) aimed at creating a center of excellence in the design and development of software in the JAVA technology environments and Microsoft. NET. telemarketing services for software products. With over 15 years of experience in the automotive industry, Casa Auto is part of the Tester company group. The success of their story has always been based on their tenacious and visionary business mantra, coupled with an honest passion for the industry. Casa Auto deals with some of the most renowned auto brands in the world (Mercedes-Benz, Smart, Hyundai, Mitsubishi, Jaguar, Land Rover, Mazda and Honda), constantly aiming to reinvent itself in order to exceed the expectations of their customers. ISSCO is THE BRAND behind successful projects, solutions and products created, delivered and maintained by ISS Consult. Focused on Romanian, East-European and West-European markets, ISSCO delivers innovative technologies by combining the proven experience and success stories of more than 15 years in worldwide ICT Development, always being client oriented. ISSCO also has grown successful projects together with its development team which set and consolidated the mission, vision and the values that guide us throughout our work. We also have been paying a great deal of attention to the market workforce potential organizing internships for the students. We are a perfect healthy combination of Outsourcing and Internal Products and Services Development, the latter ones focusing on our own solutions which we develop and market worldwide such as Fleet Management, Cloud and Quality as a Service. In the last coupe of years ISSCO has also been involved in commonwealth service, sponsoring social causes being an active part in community events. DOTW are a global B2B travel industry wholesaler whose core practices are focused on successfully connecting travel professionals around the globe. Formed in 1993 and headquartered out of Dubai, DOTW now have offices in over 25 strategic locations around the world with over 700 multilingual professional staff. At Harte Hanks they are in the business of connecting people and brands in powerful ways. From visionary thinking to tactical execution, they understand the customer journey better than anyone – and it starts and ends with data. They define, execute and optimize the entire customer experience to increase brand engagement and marketing performance across all channels including digital, social, mobile, print, direct mail and contact center. Regina Maria aims at building a health network that cares about what happens to the community, and to the people. The private health network is driven by the firm belief that the patient is priority; that caring for the needs of the patient is the only way to provide excellent services. Regina Maria’s vision is to live up to the expectations of the people with outstanding private medical services based on a strong system that believes in respecting and looking after its people. For over 60 years, Autoliv has focused on one very important issue: saving lives. Their innovative products save 30,000 lives every year and prevent 10 times as many injuries. Autoliv is the world’s largest automotive safety supplier. In the world of automotive occupant safety, they were the first to introduce the two- and three-point seat belt system and airbags for front and side impacts. They were also the first to launch pyrotechnic belt pretensioners and pedestrian protection systems. They also produce active safety systems, including brake control systems, radar, night vision and camera vision systems. Human errors cause more than 90% of all fatal crashes, and the introduction of active safety systems is expected to increase road safety further, either by avoiding or reducing the speed of impact. Autoliv’s mission is to be the leading supplier of safety systems for the future car, well integrated with autonomous driving. ASAP’s goal is to promote Romania as a most desirable offshoring destination. Their expertise starts from statistics (companies ecosystem, technical talent resource, salary surveys, graduates no, etc. ), office market, labor laws, consultancy for opening a company in Romania, employer branding plan and technical recruiting. They are aware of the technical talent’s motivation and they aim to become their first consultancy choice when changing jobs. KRAK3N prides itself with having delivered incredible work so far for satisfied customers. Its members display technical excellency, hold world renowned technical titles and have consistently led teams towards success for the past 6 years. With Train2 Perform, performance is attitude. The company is made up of a team of skilled and enthusiastic professionals in the HR department. Train2Perform focuses on building trustworthy partnerships in management consulting. Their experience covers the following domains: training, recruiting, management consulting and HR (system & organizational analysis, coaching management). Endava is a privately-owned IT services company, with over 15 years of experience of working with some of the world’s leading Finance, Insurance, Telecommunications, Media, Technology, and Retail companies. Through the Agile Transformation and Digital Evolution propositions, Endava is helping clients evolve and transform their businesses to meet the needs of today’s and tomorrow’s customers. Endava has over 3,500 employees located in offices in North America and Western Europe and delivery centres in Colombia, Macedonia, Moldova, Romania, Serbia and Bulgaria. Along with investing in long-term customer relationships, Endava recognised the importance of providing rewarding and challenging careers for people and, by doing so, has established itself as the employer of choice for the best and brightest engineers. Voxbone offices are located in San Francisco, Austin, Los Angeles, London, Brussels, Iasi and Seoul. Among their happy customers are Skype, Zoom, Orange Business Services, FoodPanda, Deutsche Telekom, Telefónica, 8X8, NTT Communications, InContact and Serenova. The HUB aims to increase the entrepreneurial environment and support it for a long term, but for that they need reliable players to join and act accordingly. In that sense, they are addressing companies that are open to an honest dialogue and focused on the real needs of entrepreneurial dynamics within the region, and such companies have already joined the HUB. They want to generate the energy and the creative spirit that excite and support people in their entrepreneurial challenges. All these goals will be materialised through a series of programs, events and services that will serve the entire regional entrepreneurial community, activities that have already been tested and validated with the target group. If you want to create an app faster, and you do not have knowledge from the backend area, but you require your app to interact with a database, one accessible solution is to use Parse Server. Parse Server is an open source Back-as-a Service (BaaS) framework initially developed by Facebook which uses web-based, all-in-one Dashboard. From here, you can create classes and manage your data, to view analytics, and send push notifications. As you know, the Parse Service was shut down in January 30, 2017 (I hope you have migrated to other backend service you decided to). An easy solution for this problem is using Back4app, which is an open source backend that already uses framework and helps developers to build their apps scalable and extensible at a much faster speed. Back4app is great for developers if they are looking for flexibility, customization on source code and the capability to integrate their app with other cloud services. Read this article and learn how to create simple apps using Unity 3D and Parse Server. ASSIST Software is a software outsourcing company based in Suceava, the largest city in the North-East of Romania. Founded in 1992, ASSIST Software is present on the international market, as a supplier of innovative solutions, being a reliable and trustworthy outsourcing partner for more than 230 clients worldwide. Our teams can adapt to our clients’ demands, being able to support complete software development life cycle (requirements-development-deployment-maintenance), project management, quality assurance and consulting services. Our Microsoft Certified Partner status is recognition for our performances and competences. These competences are greatly supported by the software development team. The partnership with IBM, Intel, CISCO and HP are testament to our ability to design and deliver quality hardware and software solutions optimized for any platform.